Boeing South Carolina will soon begin final assembly of 787 Dreamliners. The workforce is being prepared with a novel approach to training that has almost unlimited potential and incorporates 3-D imaging, computer simulations and high-definition video. At sites in three countries, Boeing Fabrication employees make so many parts and assemblies for Boeing jetliners that the scope of the work boggles the mind. Some of what they do, with great pride, is featured in this photo essay. How would the pilot react? After a two-year collaboration that spanned two continents, Boeing aviation safety experts have developed a software tool that helps them better understand how flight crews respond to the unexpected, or what’s known as a “non-normal” event during flight. 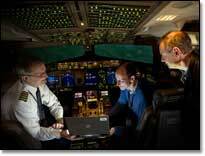 It’s an example of how Boeing employees work continuously to make flying even safer. Copyright© Boeing. All rights reserved.